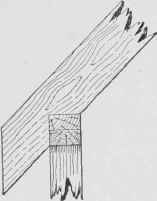 The plate serves two purposes: First, to tie the studding together at the top and form a finish for the wall; and second, to furnish a support for the lower ends of the rafters. See Fig. 106. It is thus a connecting link between the wall and the roof, just as the sill and the girts are connecting links between the floors and the wall. Sometimes the plate is also made to support the attic floor joists, as shown in Fig. 107, in which A is a rafter, B the joist spiked to the rafter, C the plate built up from 2 X 4-inch pieces, and D the wall stud. 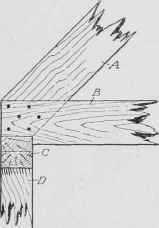 It acts in this case like a girt, but this arrangement is not very common, the attic floor joists usually being supported on a ledger board, as shown in Fig. 105. The plate is merely spiked to the corner posts and to the top of the studding; but at the corner where the plates in two adjacent walls come together, they should be connected by a framed joint, usually halved together in the same way as the sill. In the braced frame, a fairly heavy piece, usually a 4X6 inch is used, although a 4 X 4 inch is probably sufficiently strong. In a balloon frame the usual practice is to use two 2 X 4-inch pieces placed one on top of the other and breaking joints, as shown at A in Fig. 108, in order to form a continuous piece. 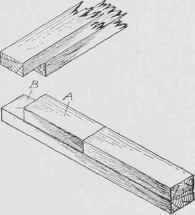 The corner joint is then formed, as shown at B. No cutting is done on the plate except at the corners, the rafters and the attic floor joists being cut over it, as shown in Figs. 107 and 109. Fig. 106. Section of Plate between Studs and Rafters. Fig. 107. Plate as Support for Attic Floor. Fig. 108. Plates Used in Balloon Framing.